The base model of the 99 was no longer called X7, but just 99 - without letters. The model offered improved ventilation and the same wheels and bumpers as L-versions. The engine was a two-liter plant developing 100 hp. The new grill design, originally used on the Combi Coupe, was on all 1975 Saab 99 models. All had the two-liter engine. Most popular was the 2-door sedan in the L-series. A popular color was the Emerald Green. 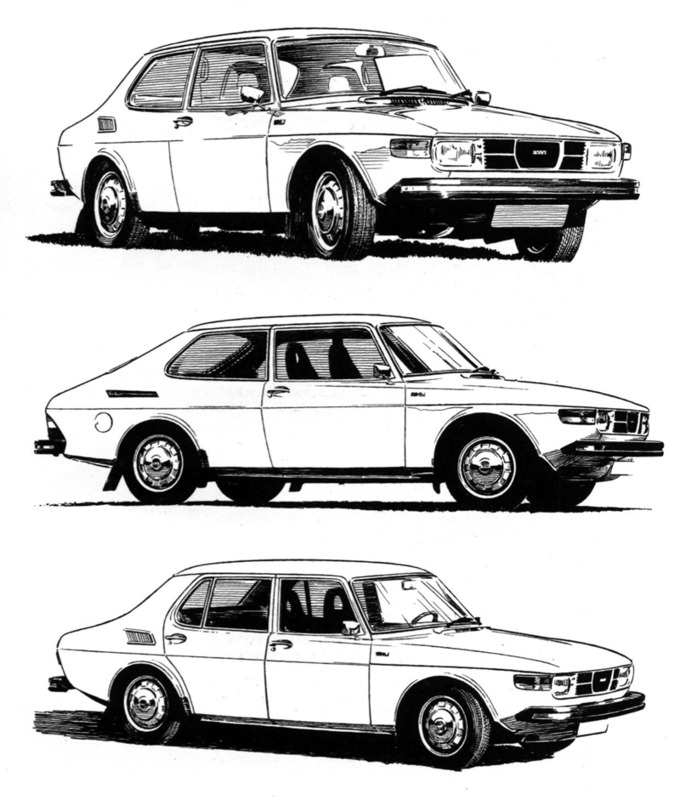 In the middle: The Saab Combi Coupe proved that a load carrier can look as good as a regular passenger car, and offer equal comfort. The Combi Coupe was 110 mm (4.3 in.) longer than other L-models and had lower air drag. One version came with fuel injected engine, automatic transmission and power steering. Below: In the home market the four door model was only available with 100 hp single carburetor engine. On the continent, however, it was often sold with the 118 hp fuel injected engine. U.S. versions developed 115 hp. The basic color for the 1975 EMS was Sterling Silver metallic. Emblems and other external decor were in black and metal grey. Only the gold Saab logo in the grill broke the color line. Shipments to the U.S. also included black EMS models - with the rear badge in silver. The double grill frame for the EMS was exclusive for that model. The electronic fuel injection had been replaced with the mechanical CI (Continuous Injection) system. The new grill, originally used on the Combi Coupe, was on all 99s for 1975. The EMS grill had an extra center frame. The two-liter engine was under the hood of all 99s, even the bottom-of-the-line former X7 version, now simply called 99. Shipments to the United States only carried 99L and 99EMS versions, all with the 115 hp fuel injection engine. (110 hp for California models). For other markets there were first two, and later three, engine options: one with a single carburetor and 100 hp output; one with mechanical fuel injection (the CI system) and 118 hp; and from February 1975 another one, with twin carburetors and 108 hp. The twin carburetor was only offered in Combi Coupe models. The compression ratio was 8.7:1 for USA cars; and 9.2:1 for all others. All 99s also had a new braking system with larger vacuum assist; reinforced steering gear; stronger drive shafts; more durable exhaust system; and larger fuel tank. New colors for 95/96, 99 and 99L for 1975 were Solar Red, Emerald Green and Coral White. Long time stand-bys Toreador Red and Polar White were gone, as was Verona Green. In May 1975 came an addition to the 99 line: a delivery van based on the Combi Coupe body. With that there were six different 99-models, but the actual number of different Saab variations was many times larger than that - about 90 including 95 and 96. When Sonett production ended, the available production at Arlov was taken over for 95 assembly. 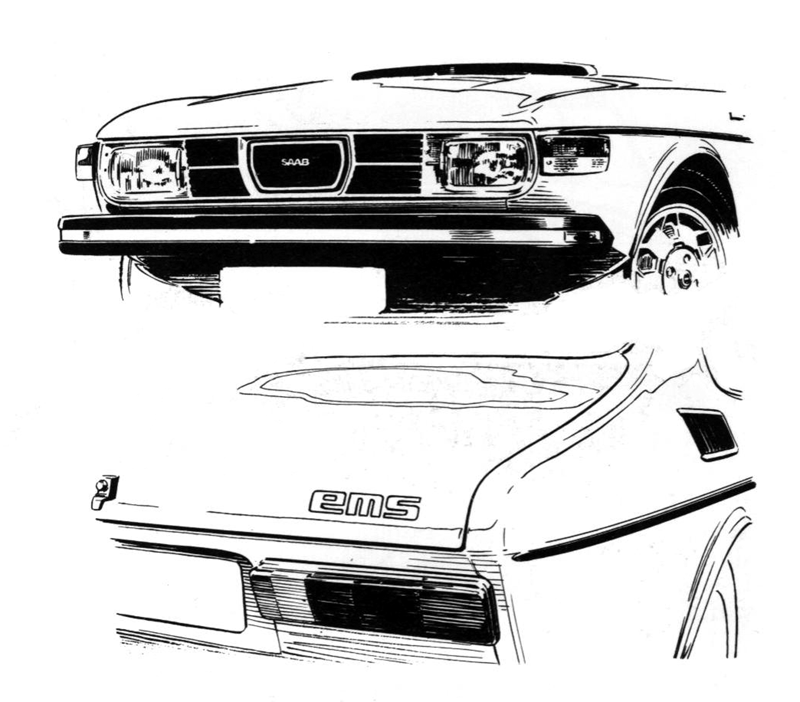 The plastic bodied sports cars were succeeded in November of 1974 by versatile, cargo-carrying metal wagons. At the end of 1975, 10,364 persons were employed within the Saab Car Division of Saab-Scania. On top of that there were 3,252 workers in partly owned subsidiaries. Facilities at the production sites in Trollhattan and Arlov, Sweden; Uusikaupunki, Finland; and Mechelen, Belgium, covered a total floor space of 288,000 square meters. In 1975, the Saab 95 and 96 models incorporated a reinforced transmission, black windshield wipers, radial tires and, on some markets, reel type seat belts in the rear. When Saab reached its Silver Anniversary in early 1975, an anniversary version of the 96 was introduced, featuring Silver metallic paint. A reinforced transmission was one of the few innovations for 1975. In its 26th year as a car maker Saab manufactured 90,962 automobiles. 48,023 of them were exported, while the rest stayed in Sweden where 44,250 registered new Saabs gave the make a 15.5 percent market share. Newspaper reports brings to mind some very successful competition years in 1974 and 1975. In 1974 Saabs took first and second in the Finnish Arctic Rally and in 1975 both first, second and third; in 1975 it was the two top places in the Finnish Snow Rally, and victories in a number of major Swedish rallies. 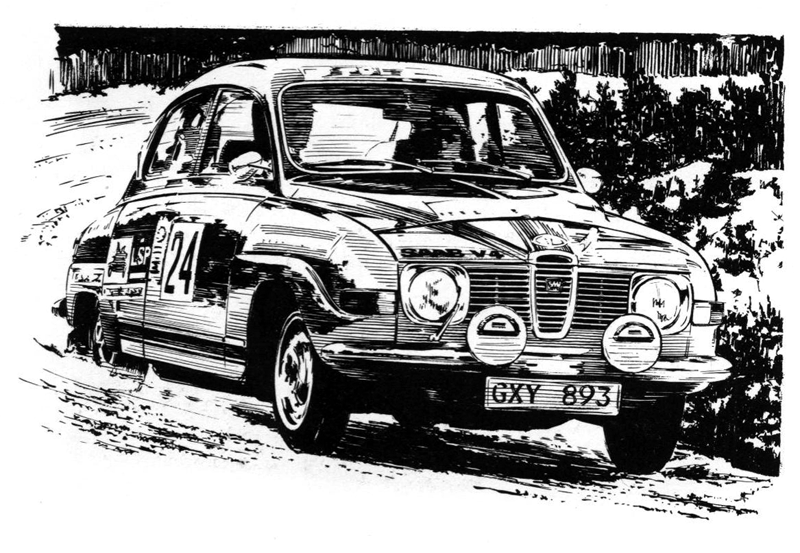 In the Swedish KAK Rally, Saab could "only" manage second, which was also the result in the 1974 RAC Rally in England. Stig Blomqvist won the first 1975 event in the European championship series, the Swedish Bergslags Rally in early January. Here he is at full speed through the snow. The reason the car has a 1969 "USA" front with round headlights is to gain a larger grill area for more air to the radiator, a necessity for a high speed, high-powered car. Copyright © 2008-present Griffin Models. All rights reserved.